RPG Group's music label HMV Saregama India Ltd has picked up 10 per cent stake in Timbre Media, a company floated by former Worldspace Radio employees, for an undisclosed sum, according to Business Line. The two firms will launch a mobile radio channel soon. 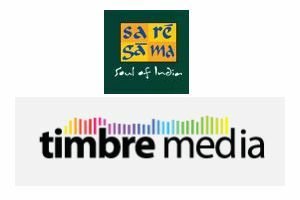 In the past, Saregama has partnered with Timbre Media to launch a variety of genre-based radio channels. HMV Saregama operates a website where it allows users to search for and listen to music through an internet radio and play casual games such as Trivia, jigsaw puzzles and memory games involving music artists. It also offers gifting of multi-CD sets, booklets, jingles, slogans and thematic compilations targeted at corporate clients such as Ranbaxy, Mercedes and Maruti Service Division. The music company also operates a website HamaraCD.com where users can shop for CDs and customise MP3s for Rs 199. HumaraCD.com has a collection of 80,000 songs. Besides these portals, Saregama delivers music from its catalogue for digital download on iTunes, MSN Music, Musicmatch and Virgin Digital. Saregama's music is also available on domestic digital stores such as Indiatimes, Sify and Bharti Airtel (through the shortcode 56060). Timber Media is a new avenue for satellite music programming, which offers customized radio content for multiple broadcast platforms, and packaged music and non-music content in various formats. The company also specializes in programming radio content for corporate entities, FM stations, DTH service providers, the telecom industry, the armed forces, hotel chains, commercial establishments, retail outlets and of course, individuals. Together, Timbre and Saregama will deliver mobile, Internet and DTH services related to music. This is in line with Saregama's increasing focus on digital media. The company recently appointed Madhusudhan R. as the Vice President â€“ Digital. At the Bombay Stock Exchange, Saregama India Ltd shares closed at Rs 70, up 3.20 per cent from the previous close.